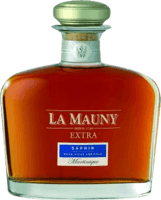 Have you found an online vendor selling La Mauny Extra Ruby? It has nothing of the classic rum with caramel flavor. It is not sweet, alcoholic and tasteless. But the perfume bottle is very beautiful. Blend of Rhums aged from 6y to 30y provided in a nice carafe with a good looking 'kind of ' mettalic cap. More tasting notes to be added. This rum was on the silver rum list for the Collector tasting during the Belgium Rum Fest. So, we expect this quality rum at the height of the reputation of La Mauny. Typical vegetal & earthy aromas, tropical fruits notes with vanilla. But whitout any personnality, short aftertaste. What's wrong ? Need to taste again but absolutely not satisfied. La bouteille est tellement belle. Le Rubis fait tellement envie que l'on ne peut pas attribuer une note inférieure à 5. Pourtant une fois le superbe packaging dépassé, le contenu est triste et très en dessous d'agricoles beaucoup moins onéreux. This is a fantastic rum... very very complex. It's a blend of aged rum between 8 and 30 years old. The taste is "tobacco oriented", caused by an aged rum. If you love agricole rum and cognac you should try it ! Voor consumptie eerst even laten rusten in het glas!